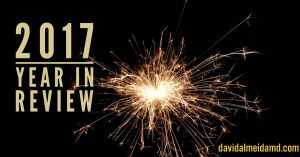 TASK AT HAND: This year I covered a multitude of topics but these stand out. In March, I deliberated on the key differences between productivity and creativity. Productivity – how we think – can be thought of as the grammar or syntax of a sentence. Creativity – what we think – are the words, concepts and emotions in that sentence. I think of productivity as the order and arrangement of a composition whereas creativity is the unique melody. While productivity tends to have basis on ordered and logical processes, creativity can be borne out of entropy and randomness. Creativity, in an unproductive individual, may emit a flash in the pan, but rarely creates enough light to sustain the night. At some point, creative findings need to be distilled into elements of capable comprehension. Seek a state of wholeness where both the synthesis and organization of new thoughts and ideas coexist. Find congruency in their relationship. Take time when you are pondering problems or reflecting on ramifications, and break down the elements of your decisions into the aspects of productivity (how you think) and creativity (what you think). This will give you valuable insight into the overall process. You will be surprised at your creativity, and you will appreciate the process for decoding it. You can find the original post here. A concept that continues to require emphasis stems from the Stoic teaching of control. In October, we concluded that we are not in control! The illusion of control is a powerful mirage that commonly creates a façade we believe to be actually present. While the desire for control may be real, in actuality, control is an illusion that can impair our judgement and create anguish and anxiety that does not exist. How can we give up on the illusion of control? First, realize you are not in control. All you can control is your reaction to events. Second, since you are not in control, then to worry is pointless. You can find the post here. Over the course of 2017, I discussed various logical fallacies and errors of bias on the Sunday Surgical Scrub. The ability to recognize bias is essential for survival. To be cognizant that we are strongly attracted to our own beliefs and that these biases, left unchecked, increase our vulnerability for errors needs to be constantly addressed. In February, we highlighted the trap of confirmation bias. Confirmation bias, also known as the confirmation trap, occurs when we procure data and information that aligns with our beliefs and ignore that which runs counter to our arguments. Bias in opinion is easier to detect and correct; however, confirmation bias – when we actively seek out information to back our preconceived beliefs – is dangerous. How do you avoid the confirmation trap? Be a cynic. Act like a doubter. Question as a skeptic. Question both the quality of the data and the validity of the source as a means to be on guard against this insidious type of erroneous logic. In September, I extolled grit; a trait commonly alluded to while, at the same time, rarely well-defined or understood. Most people identify grit as a requisite trait for success and development yet few can define its crystalline qualities. Grit is unyielding courage in the face of hardship. Grit allows your character to carry on despite conflicts and confusion. Without grit, you risk being swallowed by the tides of misfortune and disaster. You can find the original post here. Finally, in November, I summarized the two certainties in life: death and taxes. Remember, death is guaranteed. This is not simply for macabre effect. This is actually a wonderful liberation that we should use our talents and energy to effect genuine meaning in our lives and the those we come in contact with. The anxiety and worry surrounding most items is not necessary and often hinders our duty in the latter regard. 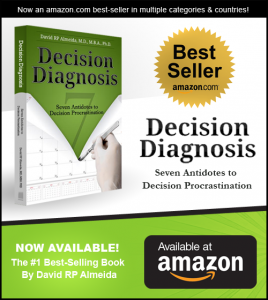 MEDICINE & MACULA: Earlier this year, I published a book entitled, Decision Diagnosis: Seven Antidotes to Decision Procrastination. Big thanks for the interest and in making it an Amazon best seller in multiple categories and in multiple countries. Many sincere thanks! The paperback and kindle version can be found here. CASE OF THE YEAR: I am grateful for another productive year that saw our research team publish numerous studies, case reports and surgical techniques. However, none garnered as much interest and attention as our case report, Deer Tick Masquerading as Pigmented Conjunctival Lesion (Robin K. Kuriakose, Lorna W. Grant, Eric K. Chin, David R.P. Almeida) published in the American Journal of Ophthalmology Case Reports. 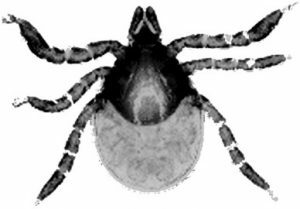 In it, we report a unique case of tick penetration of a black-legged deer tick (Ixodes scapularis) into the conjunctiva. Despite the low risk for Lyme disease, doxycycline was prescribed for prophylaxis. In any case of suspected tick penetration to the ocular surface, immediate ophthalmologic consultation and prompt removal as well as attention paid to the Infectious Diseases Society of America guidelines regarding prophylaxis. You can find the study here. 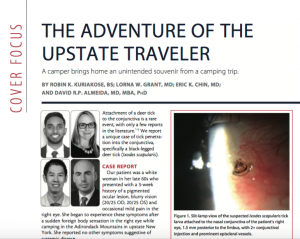 Later in the year, this case was highlighted in a special mystery cases issue of New Retina MD entitled, The Adventure of the Upstate Traveler: A camper brings home an unintended souvenir from a camping trip (Robin Kuriakose, Lorna Grant, Eric Chin & David Almeida). You can find the case here. 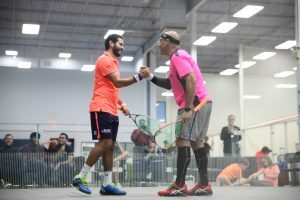 GRATIS: Lastly, I would be amiss if I did not look back on October 1st and the once in a lifetime chance to share the court with Mr Karim Abdel Gawad for a squash event hosted by Boast Squash here in MN. Gawad is a professional squash player from Egypt who reached World No. 1 in May 2017. It was humbling and an honor to share the court with a fierce talent like Gawad. I had a blast and thankful to Gawad for having some fun with us amateurs! Happy new year and best wishes to you and your loved ones in 2018! TASK AT HAND: This week I’m thinking about time alone. Whereas loneliness is traditionally considered a painful state, solitude can recharge and rekindle our energy and creativity. Time alone needs to be time well spent and is an essential component of renewing the acquaintance with ourselves. There is no potential for authenticity without being comfortable in your skin. Whether you are introvert or an extrovert, time alone pays dividends. For introverts, the act of “recharging” usually involves time alone. As a group, introverts tend to do better at consistently carving out time or reflection. For extroverts, who typically renew their energy with others, there needs to be regular commitment to the act of solitude. A few quick tips to maximize time alone. 1. Time alone outdoors trumps most activities indoors. Nature walks are king. 2. Your smartphone will ruin every precious sound moment of silence. Airplane mode is essential to protect ourselves from the endless distraction of our smartphones. Refuse to let your smartphone notify you of anything else going on. 3. A few minutes are ok. Time alone is akin to meditation and a few minutes will sometimes do. 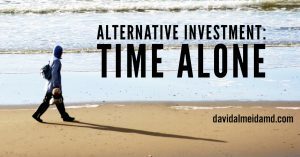 You don’t need to clear a weekend or isolate an afternoon; rather, find small pockets of time in daily routines that offer you the investment of time alone. 4. Initially, your time alone may cause you to feel bored or restless. This is a superficial transient state and will quickly fade into calmness. I consider time alone an investment in development. Like sleep restores physiological processes, solitude guides your assessment and planning. Social partnership is necessary, but at times, you need to break away alone. This is a wonderful time of year where we celebrate holidays with family, friends and loved ones; however, time alone can be hard to find. Use the quick tips above to maximize the fleeting moments that you may encounter. Finally, I’ll leave you with this thought: how can others appreciate or tolerate you if you can’t tolerate or appreciate yourself? 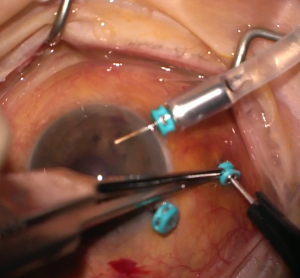 MEDICINE & MACULA: Here are stills from a surgical video of a patient I recently operated on. She had cataract surgery complicated by a massive intraoperative choroidal hemorrhage. After waiting approximately 10 days and following closely with serial echography, I took the patient to surgery for choroidal hemorrhage drainage. 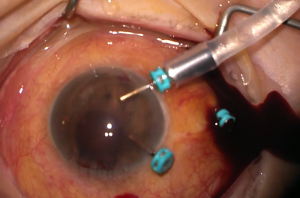 In this technique, an anterior infusion is secured and the intraocular pressure is increased to 60mmHg. Next, using a 25-gauge platform, a non-valved cannula-trocar is introduced 7mm posterior to the limbus in the most detached quadrant. The latter can be determined with preoperative or intraoperative echography and the choroidal height should be at least 5mm. Introduce the trocar with a flat approach forming an incident angle of about 20 degrees to the sclera. Here you see placement of the 25-gauge cannula 7 mm posterior to the limbus. Finally, open the cannula and, if placement is correct, the hemorrhage will drain effortlessly. Maintain the intraocular pressure at 60mm Hg during active drainage. Here you see copious amount of dark hemorrhage draining from the trocar with the infusion running. – Avoid the 3 and 9 meridians to spare ciliary nerves from possible trauma. – If possible, drain the inferotemporal quadrant first as this site is easiest to access. – If doing a vitrectomy at time of drainage, avoid an air-fluid exchange because choroidals often recur during this step and may push fluid posteriorly, endangering the macula. Instead, use non-compressible mediums like balanced salt solution or silicone oil. TASK AT HAND: This week I’m thinking about success; specifically, the fear of success. Success, this nebulous and enigmatic concept, fascinates me in that it is desired and revered but, at the same time, can create fear and depression. In a previous Sunday Surgical Scrub, I defined the achievement of success in one of two ways: either you spend your days doing what your love or you craft a life where you subsidize – with money, creativity or effort – time for that which you love (you can find the blog post here). In my opinion, there are no other acceptable definitions of success. But where do the elements of fear come from when we discuss success? Is fear just an apparition of objectives that have not yet been achieved? Or does fear and success represent a more complex interplay? There are two aspects of the fear of success that we will discuss here. First, as the Emerson quote above states, there is a natural fear of the unknown. Success, usually in terms of achievement, represents a journey we have not yet completed. Consequently, a fear of unknown outcomes is a common reaction and akin to the fear of an adventurer seeking discovery. One should use this fear as a motivator for that which we desire, pursue and value. The second aspect of fear in the context of success is more troubling and is applicable to instances where some success has already been achieved. Whether it be in business, sports, arts or simple hobbies, past success can confound further progress. The fear of success here is dependent on emotional factors where previous success leads to expected future success. The fear of not being able to “back it up” can leave us feeling like an imposter. This fear can cause us to shy away from opportunities which limits our ability for success. This can create stagnation and hinder our willingness to take on fresh challenges. Stagnation breeds depression which creates paralysis. 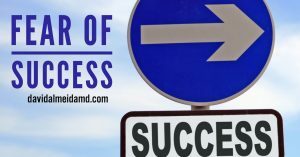 How do you overcome the fear of success? The answer, and I’ve touched on this with the Sunday Surgical Scrub before, requires a commitment to acquainting yourself with the energy and passion to move beyond this fear (check out this Sunday Surgical Scrub blog post here). Remember, worst case scenario is you don’t back it up and fail. So, what? There is no apocalyptic outcome here. There is no fatal end. You will still move on but maybe at a slower pace or in a more prolonged route. Take your task or objective seriously but realize that this fear is miniscule and let it not hold you back from that which you define as success. MEDICINE & MACULA: Last week I played in the Beyond Walls Squash Week held at the Commodore Club in St Paul MN. Beyond Walls is an incredible organization aimed at promoting academic excellence, healthy lifestyles and access to meaningful opportunities for all youth. It is a year-round scholar/athlete approach to youth development and out-of-school time for 6th to 12th grade students. 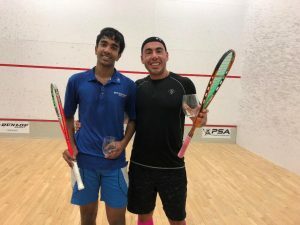 It uses a one-to-one academic mentoring with physical fitness via the racquet sport of squash aimed at community engagement and college-readiness. You can find more information here. 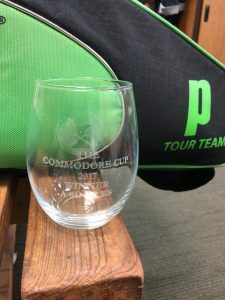 In addition to amateur singles, there was a professional singles tournament, a pro-am doubles and an amateur doubles draw. 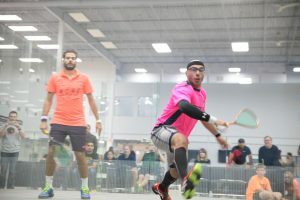 With sincere gratitude, I thank everyone involved for their energy in growing the sport of squash in the Twin Cities!! TASK AT HAND: This week I’m thinking about Shakespeare’s Hamlet. Specifically, in Act 2, there is long speech by the verbose politician Polonius. Queen Gertrude, Hamlet’s mother, quips: “More matter with less art.” She is calling for Polonius to tone down the fancy speech and get to the point. In both modern times and past cultures, the ability to get to the point is valued but unfortunately underutilized. Thomas Jefferson wrote, “The most valuable of all talents is that of never using two words when one will do.” Language allows humans a medium of communication unmatched by any other species; however, it also has the potential to create misunderstanding and confusion. Clarity is many times lost in excess. 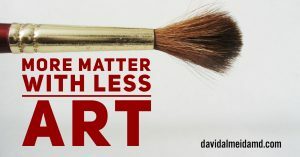 What is the best strategy to pursue this principle of “more matter with less art”? 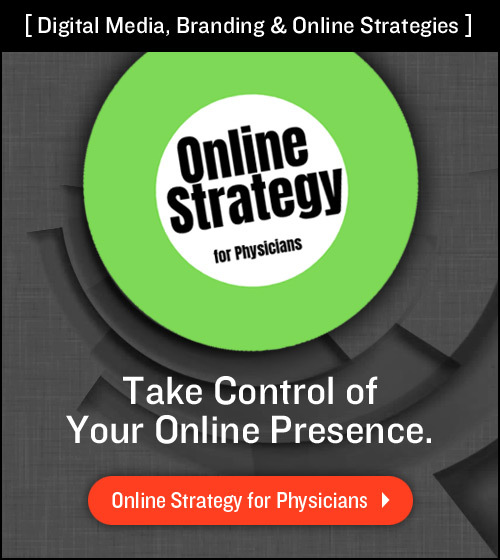 How do you remain direct without over-simplification? Albert Einstein perhaps best describes the optimal approach to answer this question: “Everything should be made as simple as possible, but not simpler”. Be deliberate in your content and message. Be as specific as possible in your brand. But don’t dumb it down. Be surgical in your commitment to cut out that which lacks value, purpose or breadth. Let us conclude today’s Sunday Surgical Scrub with a call to action of more substance, less rhetoric! Nothing more. MEDICINE & MACULA: Here are some images of me using Alcon’s NGENUITY 3D visualization system for removal of epiretinal membrane (ERM, also known as a macular pucker). 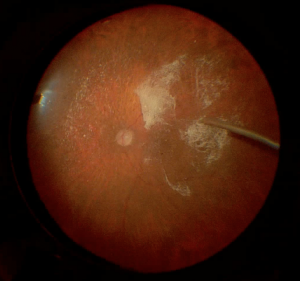 An ERM occurs when there is cellular proliferation over the macula. In many instances, this membrane remains mild and does not have any significant effect on the macula or the person’s vision. However, in other cases, membranes become prominent leading to vision loss and metamorphopsia. For visually significant membranes, vitrectomy with membranectomy is needed to remove the proliferative tissue and restore the normal macular anatomy. The Beaver Dam Eye Study (Ophthalmology 2015;122:787) showed a prevalence for ERM of 34.1% so this is a very common surgery I perform. Above is a high-magnification image of the ERM being removed with microsurgical forceps.